Note: This list was created before the reboot. Because cigarette smoking aliens are funny. 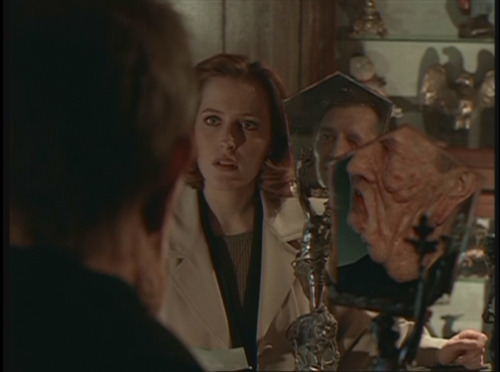 The tone of the episode, though still dark and…sorta off, like they do in the show, is slightly twisted here, seeing the X-Files world through multiple pairs of witnesses eyes, to quirky effect. Mulder and Scully are often seen more as government pawns, trying to cover up the truth about aliens, as opposed to uncovering it. 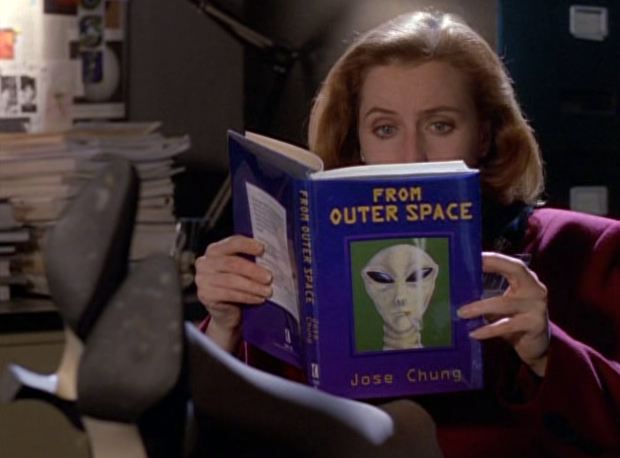 This is the only episode in which Scully seems a little starstruck. It’s an interesting telling of the story, seeing it through the eyes of a crazy science-fiction writer, piecing together reports of an X-File for a book. The way he imagines aliens are much like men in rubber suits (there’s one of those too), and he sees monsters as stop/start claymation. The man in black, played by Jesse Ventura, isn’t quite right, and the entire episode has the vibe of a B sci-fi film from the 50’s or 60’s. Everything is hyper-dramatic, which is the fun aspect to begin with. A foulmouthed agent is constantly running his mouth, literally using the word “bleeping” when he’s meant to swear (this is Scully’s compromise as she tells the story, not wanting to offend the author or…you know, the audience). Oh, and Mulder squeals when he sees a dead alien. That’s very important. A ghost story about a lovers’ suicide pact on Christmas eve lead Mulder and Scully to a supposedly haunted house, where they meet two mischievous, if likable ghosts. Scully is uncharacteristically frightened, trying to rationalize away her fear, only to encounter a new spooky element each time. The house begins to turn into a maze, rooms lead back into themselves, doors open up to brick walls, ladders disappear, floorboards open up, unearthing what appear to be corpses of Mulder and Scully themselves. The spirits try to convince the agents of what the audience has known from the first episode, about their true feelings for one another, and that the only way to end their suffering is to shoot each other. It almost works too. My favorite scene in the episode is definitely when Mulder and Scully are tricked into thinking each shot the other and are crawling along the floor, cover in blood, while “Have Yourself a Merry Little Christmas” comes lilting in from a record player. But, of course, there’s a happy ending. The ghosts are happy, together on Christmas eve and Mulder and Scully realize it was all happening in their heads, mind games from the ghosts, and they escape. That night (technically very early Christmas morning) Scully shows up at Mulder’s apartment and they exchange gifts. David Duchovny wrote and directed this episode. Like the “Hollywood Babylon” episode of Supernatural this gave the cast and crew the opportunity to make fun of the filmmaking process. The Hollywood writer is incredibly insensitive as he makes loud and unkind remarks, while taking notes at the Bureau. Tea Leoni plays the actress playing Scully, which was a little more fun before she and Duchovny’s marital crisis. There is a brilliant scene where she asks Scully to demonstrate running in high heel shoes. 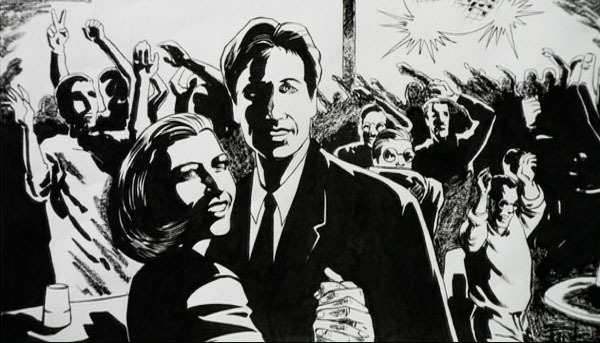 In the background you can see Scully running back and forth, being watched by Leoni, who at a certain point gets out her cell phone and strikes up a conversation, ignoring the still sprinting Scully, while in the foreground, Garry Shandling, who’s been cast as Mulder, asks the real Mulder the most asinine and insignificant questions. After Mulder and Scully make some large and messy mistakes, likely to result in the FBI being sued for thousands, Skinner puts Mulder and Scully on probation, and they have to take a month off work. They decide the best way to spend this time is to go to LA for the premiere of the afore mentioned writer’s film, based on a case they worked. Scully, Mulder, and Skinner talk on the phone in their bathtubs at the hotel they’ve been put up in. The scene’s a real fan favorite. And it ends with zombies performing a choreographed dance number. 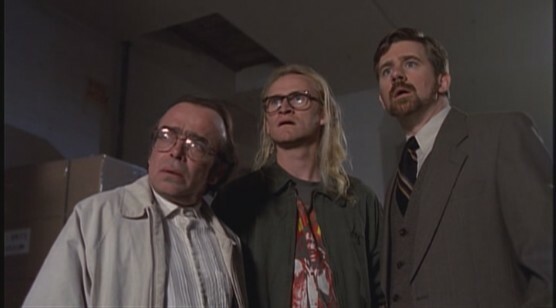 Who doesn’t love the Lone Gunmen? I’m cheating a bit here, these are technically two episodes separated, not only by a series of episodes, but by a season. It centers specifically on Byers, who develops a crush on a woman, Susanne Modeski, who’s being hunted by a secret branch of the government. At this point the Gunmen don’t know each other and antagonistic to the others when they meet. Of course, as they see more and more of the government scheme and subsequent cover up, they work together to reveal the truth. It’s also how they first meet Mulder. At the end of “Unusual Suspects,” Susanne escapes and hopes to go public with the information they found. She reappears in the next season after a drug is being tested on unwitting subjects, including Scully, who basically gets to spend the episode acting like she’s stoned. Byers’ feelings for Modeski haven’t changed, but at the end, when she asks him to come with her, he declines, feeling he could do more if he stays with the Gunmen. I like the dynamic of the three characters, one that is seen in other episodes, but more fully explored in these. Really the only downside is less Mulder and Scully, but they have enough screen time over the rest of the show to make up for it. This episode is adorable. It’s just so cute. The premise is about a man, Holman, who discovers he can control the weather, sometimes choosing to control it, and other times it rages out of control when he can’t keep his emotions in check. The main problem is his unrequited love for a woman, Sheila, he’s known most of his life, who doesn’t recognize his feelings towards her. When Mulder and Scully investigate another man, claiming he can make it rain, they discover the real rain man is Holman, and try to help him win over his love before he inadvertently creates a terrible and dangerous storm. Of course, a series of awkward misunderstandings ensue, and Sheila professes that she’s in love with Mulder. When Holman admits his true feelings for her at their high school reunion and explains that those feelings for her altered the weather, she has a change of heart (after first running and hiding in the bathroom where she has an uncomfortable conversation with Scully), cause it’s goddamn romantic, that’s why. And they live happily ever after, she’s raising a baby, while he works as the TV weatherman, blue skies, singing, “Somewhere Over the Rainbow” playing, birds flying past the window, the whole nine yards. Mulder ends up in the Bermuda Triangle and gets transported onto the Queen Anne in 1939, which is being overrun by Nazis, where every character is played by an actor with a different role on the show. There’s a nice little Indiana Jones nod, where Mulder knocks out a Nazi, and puts on his uniform to walk around the ship undetected. Scully meets up with the Lone Gunmen and finds out what happened to Mulder. She tries to enlist the help of Skinner, but his hands are tied as Skinner has been reassigned and isn’t allowed to have contact with either of them. She also has a run-in with the awful agent Spender (who also plays a Nazi on the ship). Mulder ends up on the dance floor where he runs into a woman who looks exactly like Scully. In the end (and the present), Skinner comes through and finds out where Mulder is so they can rescue him from the water. 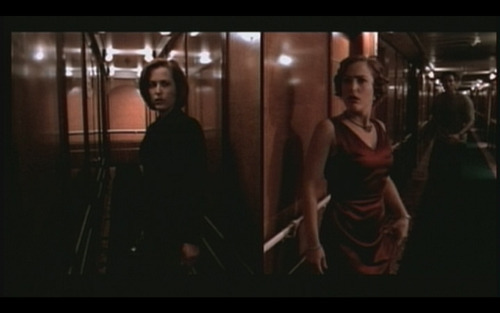 The climax of the episode is when Mulder and past-Scully are being chased by the Nazis and the only way for Mulder to escape is to jump over the side and hope that he lands back in the present. As this could also result in his death he grabs past-Scully and gives her the ultimate screen kiss. There’s a pause after they break away. And then she socks him in the jaw. When he wakes up to see Scully, Skinner, and the Gunmen, it ends like The Wizard of Oz (“you were there”). There’s also some truly incredible directing in this episode. David Duchovny wrote and directed this episode too. It’s really one for baseball fans. If you don’t care for baseball, you probably won’t care a whole lot about this one. Mulder and Scully aren’t in this episode much. It’s mostly told in flashback. An ex-cop tells the story of a baseball team of all black players, one of whom is so good at the game he’s on his way to the major leagues. The trouble is it takes place in the 40’s, and the Klu Klux Klan is after him. So is the alien bounty hunter, because he’s not actually a man at all. He’s an alien in disguise. The man in question, Josh Exley, loves playing baseball and doesn’t want to give it up, but his being noticed could also reveal his secret. He purposely throws a game when he hears some scouts are attending. Despite his best efforts, the cop finds out what he is, and promises to protect him. They grow close, but in the end the cop can’t save him from the bounty hunter, who kills him, but instead of bleeding acidic alien blood, like he should, Exley bleeds human blood, because his love for the game showed him humanity and turned him human. The cop is with him as he dies. Awww. That’s generally the reaction you get when you bring this episode up to someone who knows the show. Much like “The Rain King” this episode gets several too-friggin’-cute points. As the title would suggest, the episode is very much like a contemporary retelling of Frankenstein. Except the monster isn’t evil in the slightest, just disfigured, and the town embraces him by the end. And there’s a lot more Cher music than in Shelley’s version. The episode is filmed entirely in black and white, like a classic horror film from Universal. The creature is loved by his “father,”who actually rescued him from his real son, a mad scientist’s, experiments, but misunderstood by the rest of the town, who think a monster is loose. When his father dies, the town assumes it was “the monster.” He wouldn’t harm a fly, but the mad scientist, and then an angry mob, chase after him, until he confronts them and makes them understand that he’s good and can’t help the way he looks. Because of her role in the film Mask, the creature adores Cher, often singing and dancing to her music. The episode ends with the town attending a Cher concert, the creature joining the singer onstage, and Mulder and Scully dancing together. This episode was made surprisingly early, considering it’s near perfection. Mulder and Scully go to a town of sideshow performers after one of the performers is murdered. They seem to find Mulder and Scully just as odd as the agents find them. We also get some interesting stories about real sideshow performers and learn some of the old tricks used in circuses to swindle people out of money (Hint, if anyone offers to show you a Fiji Mermaid for cash, don’t accept. It’s a monkey and a fish’s skeleton put together). The climax takes place as an underdeveloped conjoined twin, it’s really not human, it’s very “monster of the week,”and, yes, you heard right, the evil twin did it, chases the agents through a series of fun house mirrors. It attacks the Conundrum (played by the Enigma), who eats it. Problem solved, day saved. 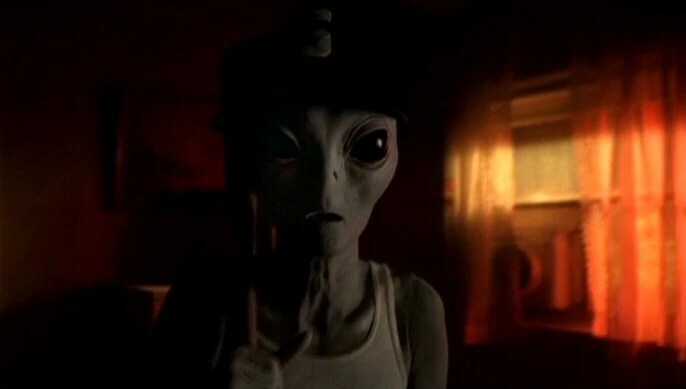 The famous moment from this episode features Scully, eating a live cricket (like it’s nothing, Gillian’s awesome), an act Mulder would not undertake. Best episode ever! I mentioned this one recently, but I’m gonna talk about it again. It’s that good. It opens with Mulder staking a man he claims was a vampire. The maybe-vamp’s family, who’s suing the FBI, claims he wasn’t. The narrative is told first from Scully’s point of view, then Mulder’s and the way they describe each other is hilarious. Scully also claims Mulder sang the theme to Shaft. As it turns out, the real story is a town of obsessive compulsive vampires (“have you noticed this man’s shoes are untied? !”), including the catcher from the sandlot and Luke Wilson, the sheriff vampire (who Scully is crushing on, and Mulder swears has buck teeth), is endangered when Sandlot vampire starts snacking on tourists. But they let Mulder and Scully go, unharmed, and they have to try to explain what happened to Skinner. This entry was posted in tv and tagged bad blood, david duchovny, gillian anderson, Hollywood A.D., How the Ghosts Stole Christmas, humbug, Jose Chung's From Outer Space, mulder, Post-Modern Prometheus, rain king, scully, Three of a Kind, triangle, unnatural, Unusual Suspects, x-files. Bookmark the permalink.